If you are like most outdoorsmen, you wish that you could be out on the lake or ocean all year around! 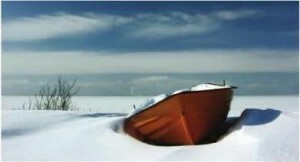 Unfortunately, most boats simply can not withstand the hard winter weather. It is very important to winterize and store your boat during the winter months. If you are in the St Paul, MN area, Anchor Marine Repair has you covered! Our goal is to make it as easy as possible for you to protect your boat with no hassle! Keep in mind that the insurance you have on your boat may not cover the damage caused by poor maintenance or neglect. Protects your investment – Let’s face it, boats are not cheap. To get the most out of your boat, all-winter storage and winterizing is a great way to keep your boat tuned up and protected from the harsh Minnesota winters. Winterizing is more than just shrink wrap – Anchor Marine is committed to inspecting your boat, changing the oil and filters, flushing the engine, washing, drain and pump the livewell, all while being stored! Provides comfort – Rather than poorly storing your boat in your yard during the winter, you can rest assured that your boat is fully protected no matter what kind of winter storm hits the Minnesota area because we store boats indoors. Pick-up boat services – We offer very convenient pick up services to keep the hassle at a minimum. Boat repair and restoration services – While storing your boat, we can fix any damage or restoration needed on your boat. Whether you just want a place to store your boat for the winter, or if you want to winterize and store your boat all at the same time, Anchor Marine Repair is your one stop shop! The amount of time and effort you put in your boat now will have a powerful effect on how your boat will perform in the years to come. So, if you are in the St Paul, Minneapolis, MN or even the Western Wisconsin area, call Anchor Marine Repair today at (763) 972-3540 before the wintery weather arrives!